If you’re like me, you’ve made APIs for all kinds of random things. Noble causes, like a back-end to the app you built (e.g. Lyft’s back-end, sending pricing to Google Maps, or Pilgrim Coffee, my now sadly defunct map of the best coffee in the world). 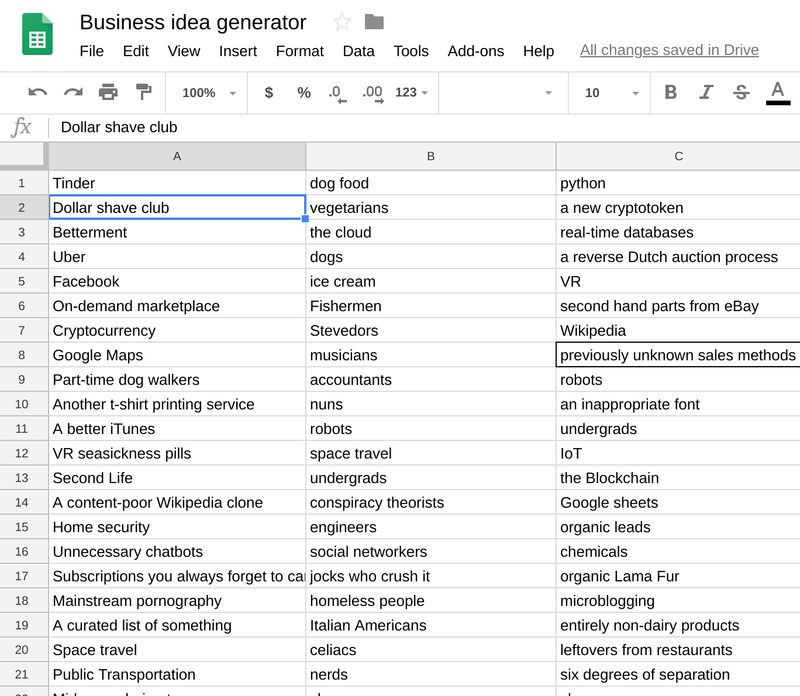 Or totally random things, like my random startup business generator. You can see the output of the API by clicking here. Here’s how to build a simple API that you can send a HTTP GET request to and get an answer from. It runs off a database based entirely in Google Sheets. Set up your Google Sheet with your data and basic logic. I send it a ‘1’ or a ‘2’, and depending on what I send, I return a different kind of business type. For ‘1’, I return “X for Y”. For ‘2’, I return “X for Y using Z”. I didn’t need to, this is just for the purpose of the exercise. Most of this code is not important, just logic to make the silly web app work. Here are the important bits. 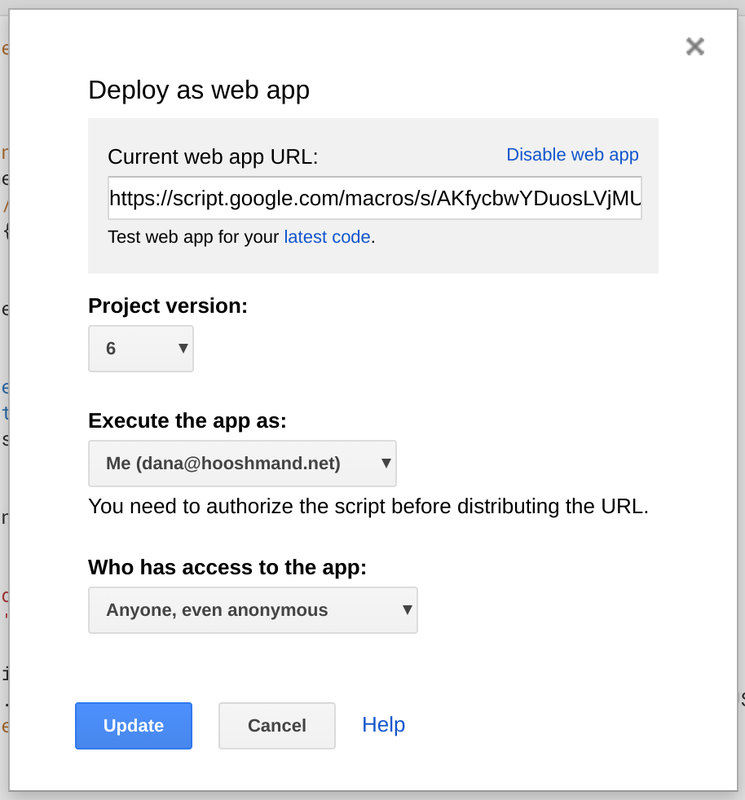 When you click on Publish → Deploy as web app and publish it, you get a URL. Note that every time you make a change to code, you have to save it and publish it again with a new project version each time. Also make sure you specify ‘Anyone, even anonymous’ can access the app. You can then send parameters via the URL, i.e. append ‘&type=2’ to the end. Note: Use ‘parameter’, without the ‘s’ (i.e. not ‘parameters’). If you have the plural form, then the structure is a little different — each key has an array of values. See here for more details. As you construct your output, you have to format it into a string and send it back the right way so that the receiver receives it as JSON. And there you have it. Try it! It’s a little slow (response time is about 2 seconds) but it works.